Mushroom risotto is a popular vegetarian Italian rice dish which makes for a suitable gourmet vegetarian entree whether dining out or at home. This is not a low-fat, healthy version, but rather a more traditional full-fat and indulgent recipe when you want nothing but pure, rich, decadent flavor. The ingredients include shallots, butter, garlic, white wine and yes, heavy cream and Parmesan or other hard cheese, such as Romano or Asiago. All of that adds up to a whole lot of deliciousness. If you're looking for something a bit lighter and lower in fat, try this low-fat dairy-free vegan risotto made with sun-dried tomatoes for extra flavor, or, for something different than a classic Italian risotto, try this vegan pumpkin risotto recipe which is also quite low in fat. Or, keep browsing with a few more amazing vegetarian (and vegan!) risottos here. 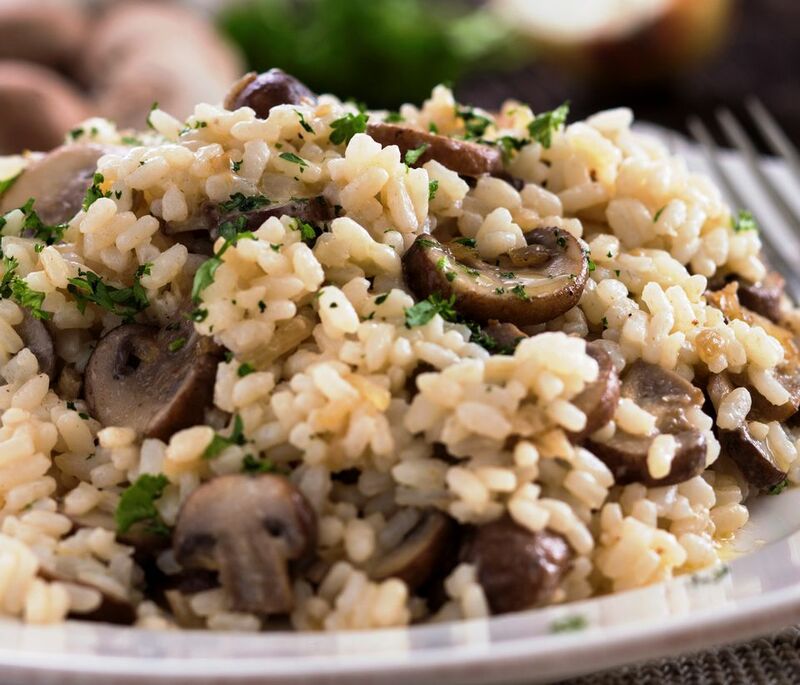 Along with plenty of butter and cream, this vegetarian mushroom risotto recipe uses shallots, Porcini mushrooms and button mushrooms for a savory and creamy Italian vegetarian risotto you can serve up for a casual evening or a special occasion. Though risotto is often served as a side to a meat dish, it is usually served as a main course for vegetarian meals. Whip up a side salad, and maybe some homemade garlic bread, and you've got yourself a full meal. And the wine? Something red and Italian, like a Chianti, or, you can also use the same white wine you use in cooking the risotto. Enjoy! In a large pot, combine the butter, garlic, shallots, mushrooms and Arborio rice and heat over medium heat for about 2 minutes, stirring well to avoid scorching the garlic and shallots. With the lid off, add the vegetable broth and cream, and let simmer on low until liquid is absorbed; approximately 25 minutes, stirring regularly. Add the Parmesan or Romano cheese, stirring well to encourage it to melt. Once the cheese is melted, season your risotto lightly with sea salt and fresh cracked black pepper to taste. Garnish with a bit of fresh chopped parsley, if you'd like, and serve with a bit of extra grated cheese to top it all off for a nice presentation.